My kids are always into water balloons, they love to throw them at eachother and see who can hit the other person the most. I love that the Kaos Pump Station with Color Bomb System now comes with color bombs, so that when they throw the balloons, you can see a splash of color and know who hit who! 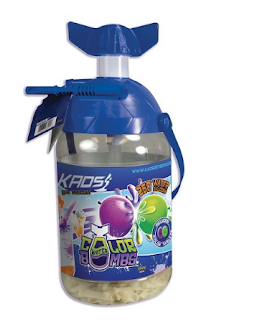 KAOS Portable Battle Pump is the number one water balloon filler to date! This pump station features a redesigned nozzle to include a new color bomb system! New Color bomb tablets have the ability to change the color of your water bomb. Throw them to see vibrant splashes as they explode! With the easy to use tie-knot filler, just fill, tie, and throw! The Pump Station also comes with 250 water balloons for HOURS of fun!